Uruguay, which also benefited from an own-goal in the first half, had their third straight shutout of the tournament after consecutive 1-0 victories over Egypt and Saudi Arabia. 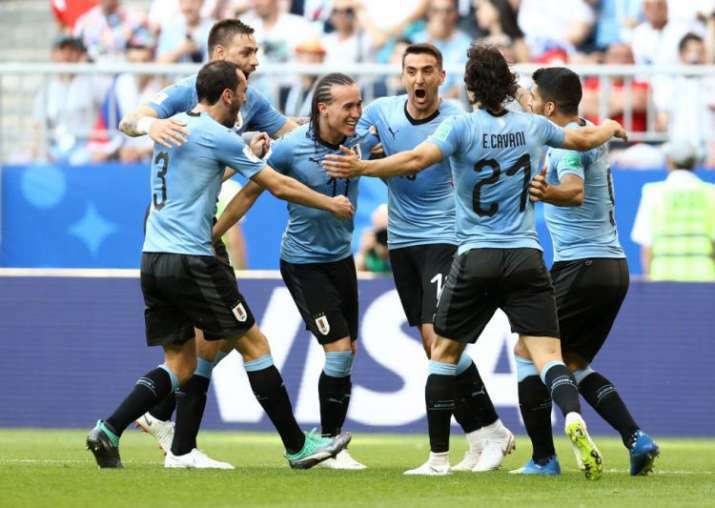 Both teams were already assured of spots in the knockout round, but Uruguay's victory put them at the top of Group A and looking toward a match in Sochi on Saturday against the second-place finisher from Group B. Is Mohamed Salah considering retirement from national team? By advancing to the round of 16 with victories over Saudi Arabia and Egypt, Russia secured their best World Cup showing in the post-Soviet era. Suarez, who seems to have put past World Cup controversies behind him, scored with a low shot from just outside the box that sailed past the wall of Russian players and into the right corner of the goal. The Barcelona striker blew a kiss to the corner of Samara Stadium where most of La Celeste's cheering supporters were seated. Uruguay went up 2-0 over Russia on an own-goal — the sixth of the World Cup to tie the tournament record. Midfielder Diego Laxalt's shot from long range deflected off Denis Cheryshev's foot and past goalkeeper Igor Akinfeev. Uruguay were making its 12th appearance at the World Cup, which they won in 1930 and 1950. More recently, the team finished fourth in South Africa in 2010 and made the round of 16 in Brazil four years ago. Russia left-back Yuri Zhirkov was taken out of the match against Egypt because of an ankle injury but was available as a substitute on Monday. Teammate Alan Dzagoev was out again because of a hamstring injury sustained in the opener against Saudi Arabia but he may return for the knockout round. Both teams will face the top finishers from Group B, which includes Portugal, Spain, Iran and Morocco. By finishing second, Russia will play at the Luzhniki Stadium in Moscow against the Group A winner. Because Russia had the advantage in goal differential from their first two group matches, they would have won the group with a draw. Russia's home-country advantage could only carry them so far against their more experienced opponents. But the Russians had recent history to think they were up to the challenge: The teams played to a 1-1 draw in a 2012 friendly in Moscow. Suarez scored in that match, and thwarted Russia in this one, too. His goal on Monday was the 53rd of his career, in his 101st appearance. It was his second goal of the tournament after also scoring in the 1-0 victory over Saudi Arabia. No Uruguayan players have been handed yellow cards in Russia. The only other team at the tournament without a yellow is Iceland.